In Brief: Pancreatic Enzyme Replacement Products | The Medical Letter, Inc.
Pancreatic enzyme replacement products have been used for years to improve digestion in patients with exocrine pancreatic insufficiency (EPI). These products were initially marketed before formal FDA approval was required; in 1991, however, the FDA told all manufacturers of pancreatic enzyme replacement products that they would have to submit a new drug application by April 2010 in order to keep their products on the market. All pancreatic enzyme replacement products in the US contain a mixture of porcine-derived amylases, lipases, and proteases. All of the products except Viokace are available in delayed-release capsules containing enteric-coated beads, spheres, microspheres, or microtablets to protect lipase from denaturation by gastric acid. 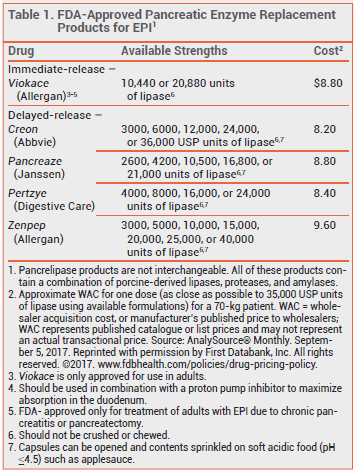 Viokace immediate-release tablets should be taken with a proton pump inhibitor to improve release of pancreatic enzymes in the duodenum.2 Because the rate and extent of dissolution of these products vary, they are not considered interchangeable. Pancreatic enzyme replacement products are generally well tolerated. Common adverse effects include headache, dizziness, abdominal pain, and flatulence. A Fieker et al. Enzyme replacement therapy for pancreatic insufficiency: present and future. Clin Exp Gastroenterol 2011; 4:55. MR Struyvenberg et al. Practical guide to exocrine pancreatic insufficiency – breaking the myths. BMC Med 2017; 15:29. PM Farrell et al. Diagnosis of cystic fibrosis: consensus guidelines from the Cystic Fibrosis Foundation. Available at: www.jpeds. com. Accessed September 28, 2017.